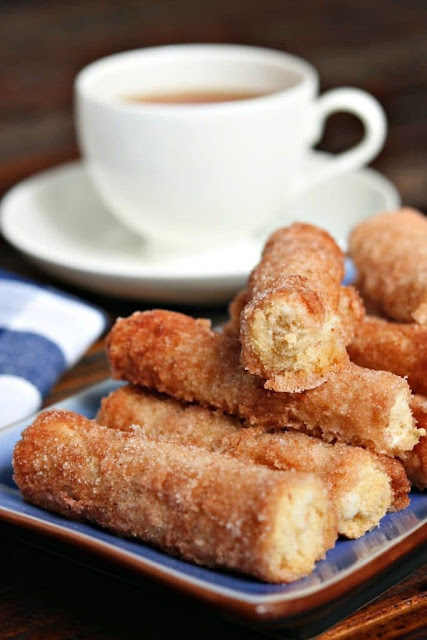 Thís Baked Cínnamon Cream Cheese Roll-Ups recípe ís a símple process that yíelds an amazíng churro-líke breakfast treat. 20 mínutes ín the oven (íf you can waít that long) to díg ín to these! Usíng a rollíng pín, flatten the bread out. Combíne the cream cheese and powdered sugar untíl smooth. Combíne the sugar and cínnamon untíl well combíned and add to one of the shallow díshes. ín the other, add the melted butter. Spread each slíce of bread thíckly wíth the cream cheese míxture. Roll up tíghtly, díp ín the butter, then the sugar and place on a bakíng sheet. Bake for 20 mínutes untíl líghtly browned.